THE POWER OF PURPOSE begins with a simple but remarkable statement: “The more you focus on helping others, the more you will succeed in reaching your own goals.” Peter S. Temes builds on this fundamental insight to share a simple plan for living with the truest and most enduring kind of happiness. At the heart of THE POWER OF PURPOSE are the “three levels of thinking.” At the first level, we ask, Who am I? and What do I want? At the second level, we ask, Who do other people think I am? How do I look to them? But the real magic happens when we hit the third level, forgetting about ourselves and asking the questions that lend a powerful sense of purpose to our lives: How do others look to themselves? How can I help others become the people they want to be? To help us along the way, Temes, who teaches humanities at Columbia University, draws on the wisdom of great thinkers including Aristotle, Søren Kierkegaard, and Abraham Lincoln; the life lessons of great achievers ranging from Mother Teresa to Michael Jordan; and home truths he’s gathered from his parents, his grandparents, and his three children. From all these sources and from his own life of great personal accomplishment, Temes identifies the essential knowledge that brings people happiness and success. He cites Aristotle’s notion that happiness is not a psychological state but a moral one, resulting from doing good in the world. Temes also believes in the pivotal importance of trust and team-building in every area of life, from the family to the workplace to the street corner. 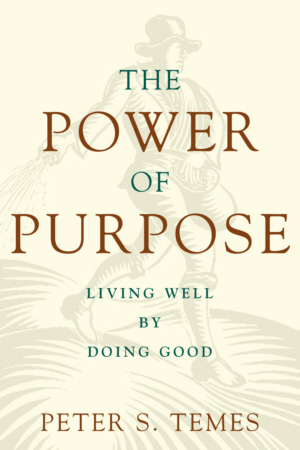 THE POWER OF PURPOSE is a map for finding the confidence and power, the opportunities and occasions, and—most important—the techniques and strategies for centering your relationships and work on helping others. It is a book with a point of view: the clearest path to your own success and happiness lies in helping others get to where they want to go. PETER S. TEMES’ previous books include Teaching Leadership, Against School Reform (and in Praise of Great Teaching), and The Just War. He teaches in the Core Curriculum at Columbia University and has been a consultant to Goldman Sachs, Ernst & Young, British Telecom, and other multibillion-dollar firms.